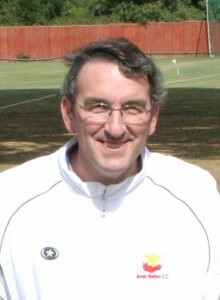 Having managed the Under 13 team for 2 seasons from 2006-2007, Clive turned his attentions to managing the C Team in 2008 and, in the 5 seasons as the C Team established itself, he did a brilliant job. He has also proven to be a very reliable 12th man and the usual problems of late call-offs affecting the 4th team meant he has actually got to play occasionally. Wanting a bit more than the ‘occasional’ game, Clive was also instrumental in setting up the Sunday A Team with Kevin Frazer and this proved a great success. An enterprising 31 not out showed there is more to Clive than a solid forward-defensive – in fact he also surprised everybody a few season’s ago by hitting 38, in one C Team victory. He has also taken several excellent slip catches. We often wish ‘Beanpole’ Clive – he stands at about 6′ 3″ – could bowl like Joel Garner but the reality is that his only delivery is the Beefy-patented ‘moon-ball’! A softly-spoken ‘gentle-giant’ Clive, who works for the City Council, has played a major role in Melton’s junior set-up as Chairman of the Junior Committee from 2009-10 and as a Level 1 Coach. He’s not good with keys, though, and is wholly responsible for the sight of 22 grown men plus, wives, girlfriends, children, dogs, cricket bags and picnic hampers seen emerging from a small hole in the fence in order to play a game of cricket at Town Close 2012. Clive took on the role of U11 Team Manager in 2013-14 and enjoyed a well-deserved day at Lords as his youngsters gave an on-pitch Kwik Cricket demonstration in the lunch break of the Ashes Test. His U11s became the first Melton side – other than the girls – to win a County trophy when they beat Swardeston in the Terry Moore Trophy in 2014 and also won the South Norfolk Community League. Clive moved up with them and, as U13s Manager for the last 2 seasons and his philosophy of giving as many youngsters a game as possible whilst remaining competitive, brought another South Norfolk Community League title and an appearance in the Alan Bridgewater Final. This season he has again moved, with his developing squad, to be U15s Manager. Like his son Nick, Clive always seems very relaxed and unflustered and he still likes to get a bit of cricketing action. To date he’s played 47 games for Melton. He and wife, Susanne, are also not averse to showing us a few of their Ballroom and Latin dance moves at the Presentation Dinner.